One day of marine traffic in the Baltic Sea. An unofficial visualization technology preview made originally for HELCOM (Baltic Marine Environment Protection Comission). NASA Earth Observatory image by Jesse Allen and Robert Simmon, using Landsat data from the U.S. Geological Survey. Twenty kilometers (12 miles) from England’s Kent and Essex coasts, the world’s largest offshore wind farm has started harvesting the breezes over the sea. Located in the Thames Estuary, where the River Thames meets the North Sea, the London Array has a maximum generating power of 630 megawatts (MW), enough to supply as many as 500,000 homes. The wind farm became fully operational on April 8, 2013. Twenty days later, the Operational Land Imager (OLI) on the Landsat 8 satellite captured this image of the area. The second image is a closeup of the area marked by the white box in the top image. 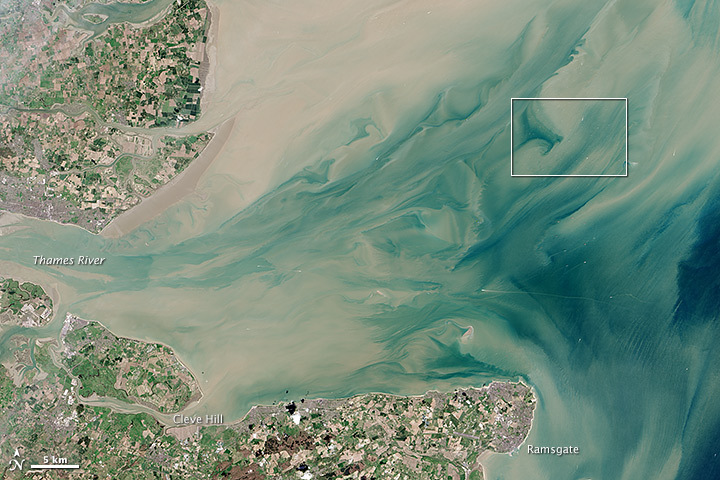 White points in the second image are the wind turbines; a few boat wakes are also visible. 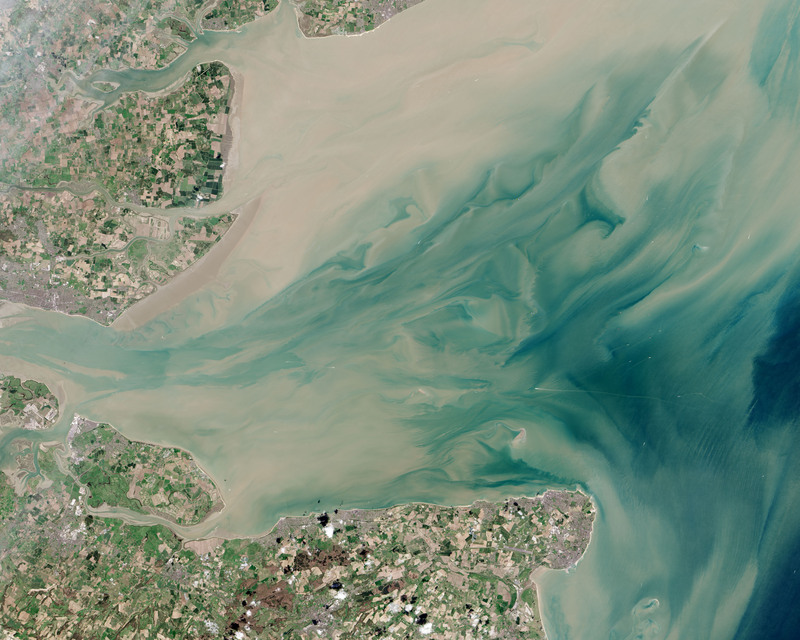 The sea is discolored by light tan sediment—spring runoff washed out by the Thames. To date, the London Array includes 175 wind turbines aligned to the prevailing southwest wind and spread out across 100 square kilometers (40 square miles). Each turbine stands 650 to 1,200 meters apart (2,100 to 3,900 feet) and 147 meters (482 feet) tall. Each is connected by cables buried in the seafloor, and power is transmitted to two substations offshore and to an onshore station at Cleve Hill. With construction operations working out of Ramsgate, the Array is eventually supposed to grow to 245 square kilometers (95 square miles). The wind farm sits on two natural sandbanks, with water as deep as 25 meters (80 feet). The site was chosen because of its proximity to onshore electric power infrastructure and because it stays out of the main shipping lanes through the area. Promoters of the London Array project assert that it will reduce annual carbon dioxide emissions by 900,000 tons, equal to the emissions of 300,000 automobiles. Critics of the project and its second phase are concerned that the wind farm will decimate the population of red-throated divers and other bird species. Samuel de Champlain, known as The Father of New France, was a Frenchman with many titles including navigator, soldier, explorer, cartographer, and diplomat. Born Samuel Champlain in 1574 to a family of mariners, exploration was in his blood and he took his first voyage as a young man in 1603, led by François Gravé Du Pont. In his early years, Champlain learned to navigate, create nautical charts, draw, and make applied reports. From 1594 or 1595 to 1598, he learned fighting skills in the King Henry IV army during the late stages of France’s religious wars against Brittany, which would equip him with the necessary defense skills required to be at sea on a French vessel. Some of Champlain’s early travels include a two-year trip aboard his uncle’s ship, the Saint-Julien, which he was given watch duty over while it traveled with a Spanish fleet to the West Indies. When he returned to Cadiz in 1600, his uncle asked him to take over his business affairs due to illness and a year later, after his uncle passed away, he inherited his estate, 150-ton ship, a yearly pension from the king, and his commercial properties located in Spain. This gave him the ability to explore without needing to please financial backers. Between the years of 1901 and 1903, he worked as a geographer for King Henry, traveling to French harbors and learning about North America from fishermen that traveled seasonally to an area ranging from Nantucket to Newfoundland. 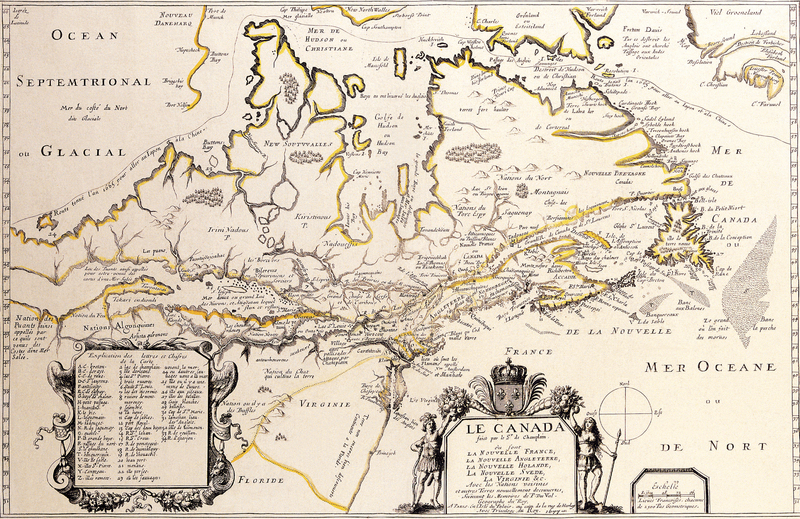 Champlain prepared several maps of New France, much of which land he had himself traversed. This map (1632), which accompanied his description of the country, is remarkable partly because of its cartographic techniques of hachured hill symbols, and vegetation and settlement symbols, and partly because of the concepts of western and northern geography which he presented. He believed that the Arctic Ocean (Mer du Nort Glacialle) extends south to the west of Hudson Bay, and to a short distance north of Lake Superior (Grand Lac). In effect, what is now Manitoba would be fundamentally located in these icy waters. 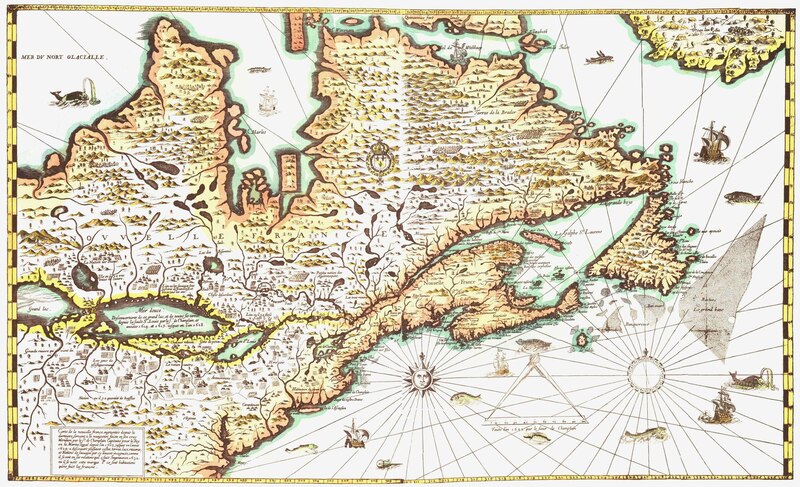 Champlain’s map is significant, not so much for what it depicts of the western area, but because it was a mother map [base map] whose features were used by many later cartographers in conjunction with their new ideas to illustrate their concepts of Western geography. Champlain took his first voyage to North America on a fur trading ship, although he did this only as a passenger. François Gravé Du Pont, who would later become a good friend to Champlain, led the expedition and taught Champlain how to navigate North America. He joined a second expedition to North America in 1604, promising to update the king if there were any new discoveries. Pierre Dugua de Mons, who owned the monopoly on fur trading in New France directly from the king, led this expedition and allowed Champlain to choose where the crew would stay during the winter. In 1608, Dugua requested that Champlain establish a French Colony along the St. Lawrence shore, where the two had previously explored. Three ships were attained for this mission, including the Don-de-Dieu, which was captained by Champlain and the Lévrier, which was captained by Du Pont. The city of Quebec was founded because of this expedition. When King Henry was murdered in 1610, Champlain lost many of his financial backers, including Dugua, because the new king, then nine years old, and his regent Marie de’ Medici did not feel that exploration was important. Champlain was forced to return to France to make new connections within the court. It is thought that his marriage to twelve year old Marie de’ Medici, the daughter of an important man who helped carry out orders within the court, only occurred for this purpose. She eventually joined a convent and Champlain later adopted three Montagnais girls. While exploring the area that would become New France, Champlain established relations with many native tribes including the Algonquin, the Montagnais, Wendat, and Etchemin tribes, all of whom lived in the St. Lawrence River area. These tribes requested aid from Champlain and his men to fight with the Iroquois, and after a short yet successful battle, Champlain returned to France to attempt to restore Dugua’s fur monopoly, but this failed. When Champlain returned to New France in 1613, he decided to explore the Huron country and look for what is now considered Hudson Bay. With the help of native tribes who were threatened by the Iroquois, he was able to explore other areas and document his travels between the years of 1604 and 1612. In 1615, he helped wage a war against the Iroquois, against his better judgment, and ended up getting lost and wintering with another tribe, returning to France in 1616. In 1620, Champlain returned to New France to strengthen the administration of the area and create more relationships with natives in the area. He spent the rest of his life working in the area, during which time he made a peace treaty with the Iroquois, tried to find a route to China, and published his book Voyages de la Nouvelle France. After an encounter with the Kirke brothers, which resulted in the surrender of Quebec and the removal of the people there, Champlain was forced to travel to London. Despite the fact that a peace treaty had been signed three months before this, Champlain would not rebuild Quebec until 1634. Champlain passed away in 1635 from a severe stroke, but he did not leave any heirs. Records show that he left much of his property in France to his wife, Hélène, but his estate went to his cousin Marie Camaret after she challenged it in court. Champlain’s remains were buried in a church for a short time, but his permanent burial site remains unknown to this day. Samuel de Champlain, known as The Father of New France, was a Frenchman with many titles including navigator, soldier, explorer, cartographer, and diplomat. Born Samuel Champlain in 1574 to a family of mariners, exploration was in his blood and he took his first voyage as a young man in 1603, led by François Gravé Du Pont. In his early years, Champlain learned to navigate, create nautical charts, draw, and make applied reports. From 1594 or 1595 to 1598, he learned fighting skills in the King Henry IV army during the late stages of France’s religious wars against Brittany, which would equip him with the necessary defense skills required to be at sea on a French vessel. Some of Champlain’s early travels include a two-year trip aboard his uncle’s ship, the Saint-Julien, which he was given watch duty over while it traveled with a Spanish fleet to the West Indies. When he returned to Cadiz in 1600, his uncle asked him to take over his business affairs due to illness and a year later, after his uncle passed away, he inherited his estate, 150-ton ship, a yearly pension from the king, and his commercial properties located in Spain. This gave him the ability to explore without needing to please financial backers. Between the years of 1901 and 1903, he worked as a geographer for King Henry, traveling to French harbors and learning about North America from fishermen that traveled seasonally to an area ranging from Nantucket to Newfoundland. Champlain took his first voyage to North America on a fur trading ship, although he did this only as a passenger. François Gravé Du Pont, who would later become a good friend to Champlain, led the expedition and taught Champlain how to navigate North America. He joined a second expedition to North America in 1604, promising to update the king if there were any new discoveries. Pierre Dugua de Mons, who owned the monopoly on fur trading in New France directly from the king, led this expedition and allowed Champlain to choose where the crew would stay during the winter. In 1608, Dugua requested that Champlain establish a French Colony along the St. Lawrence shore, where the two had previously explored. Three ships were attained for this mission, including the Don-de-Dieu, which was captained by Champlain and the Lévrier, which was captained by Du Pont. The city of Quebec was founded because of this expedition. When King Henry was murdered in 1610, Champlain lost many of his financial backers, including Dugua, because the new king, then nine years old, and his regent Marie de’ Medici did not feel that exploration was important. Champlain was forced to return to France to make new connections within the court. It is thought that his marriage to twelve year old Marie de’ Medici, the daughter of an important man who helped carry out orders within the court, only occurred for this purpose. She eventually joined a convent and Champlain later adopted three Montagnais girls. While exploring the area that would become New France, Champlain established relations with many native tribes including the Algonquin, the Montagnais, Wendat, and Etchemin tribes, all of whom lived in the St. Lawrence River area. These tribes requested aid from Champlain and his men to fight with the Iroquois, and after a short yet successful battle, Champlain returned to France to attempt to restore Dugua’s fur monopoly, but this failed. When Champlain returned to New France in 1613, he decided to explore the Huron country and look for what is now considered Hudson Bay. With the help of native tribes who were threatened by the Iroquois, he was able to explore other areas and document his travels between the years of 1604 and 1612. In 1615, he helped wage a war against the Iroquois, against his better judgment, and ended up getting lost and wintering with another tribe, returning to France in 1616. In 1620, Champlain returned to New France to strengthen the administration of the area and create more relationships with natives in the area. He spent the rest of his life working in the area, during which time he made a peace treaty with the Iroquois, tried to find a route to China, and published his book Voyages de la Nouvelle France. After an encounter with the Kirke brothers, which resulted in the surrender of Quebec and the removal of the people there, Champlain was forced to travel to London. Despite the fact that a peace treaty had been signed three months before this, Champlain would not rebuild Quebec until 1634. Champlain passed away in 1635 from a severe stroke, but he did not leave any heirs. Records show that he left much of his property in France to his wife, Hélène, but his estate went to his cousin Marie Camaret after she challenged it in court. Champlain’s remains were buried in a church for a short time, but his permanent burial site remains unknown to this day. Japanese fishermen transporting slaughtered dolphins in Taiji harbour; the water of the cove is red with the blood of dead animals. Hundreds of dolphins are killed in a remote Japanese bay during hunting season. Japanese fisherman have begun the slaughter of hundreds of bottlenose dolphins this morning, campaigners said, amid an international outcry over the annual hunt. Members of the Sea Shepherd Conservation Society (SSCS), which is monitoring the cull, said fisherman had begun killing the dolphins corralled into the Taiji cove earlier this week at 7.30am. A group of dolphins trapped by Japanese fishermen were killed on Tuesday (January 21), after fishermen herded them onto the shore in a cove in central Japan. At least 30 dolphins, trapped in the now infamous Taiji cove since Friday (January 17), were seen being driven by fishermen using nets and boat engines towards a killing area. Fishermen waiting in the shallows, some in wet suits, wrestled the dolphins into submission and tied their tails with ropes to stop them from escaping. Washington and Tokyo, normally the staunchest of allies, have been drawn into an unexpected diplomatic spat over the slaughter of the mammals in the secluded cove. Japan’s top government spokesman Yoshihide Suga, defended the controversial cull in the town of Taiji as “lawful”, swatting away criticism from the US ambassador, Caroline Kennedy. Ms Kennedy, the only surviving child of the assassinated US President John F Kennedy, joined the chorus of global outrage this week when she said her government opposed the practice. “Deeply concerned by inhumaneness of drive hunt dolphin killing,” she tweeted, as fresh images appeared online showing apparently bloodied dolphins being herded into the cove for the slaughter, which is expected to take place today. Conservationists say a rare albino dolphin is among about 250 of the animals thrashing behind nets overnight. “Babies and mothers will be torn from each other’s sides as some are taken for captivity, some are killed, and others are driven back out to sea to fend for themselves,” said the SSCS. The hunts are notoriously brutal. Fishermen on boats surround pods of migrating dolphins, lower metal poles into the sea and bang them to frighten the animals and disrupt their sonar. Once the dolphins are herded into the narrow cove, the fishermen attack them with knives, before dragging them to a harbour-side warehouse for slaughter. The best-looking dolphins are separated and sold to aquariums. Ms Kennedy’s message was translated into Japanese and retweeted thousands of times, prompting a backlash by nationalists who resent Western criticism of the cull. “Laughable,” wrote one anonymous post to an online bulletin board. Traditionalists say dolphin and whale have been eaten locally for centuries. Restaurants and shops offer dolphin and whale sashimi and blubber, along with tuna and shark-fin soup. Dolphin meat sells for around £6-£10 a pound. Some local fishermen say the cull is necessary to keep dolphins from eating too many fish. Taiji was exposed to worldwide scrutiny four years ago in the Oscar-winning documentary The Cove, which followed a party of eco-activists as they battled fishermen and police to stop the cull. The documentary was attacked by Japanese ultra-rightists who threatened cinemas that showed it, and by Taiji officials who said the documentary-makers had “psychologically tortured” the fishermen. The Cove triggered a brief, heated debate in the Japanese media, which had largely ignored the practice until then. Many activists, including the most famous – Ric O’Barry, a former dolphin trainer-turned-campaigner – predicted the global spotlight would end the tradition. “I honestly believe when the world finds out about this it will be abolished,” he said. But the annual cull of about 2,000 small porpoises and dolphins has continued. The former Guns n’Roses drummer Matt Sorum is among the latest high-profile campaigners to visit the town. “In what boats did they chase these dolphins with centuries ago?” he tweeted. Last year the local prefecture announced plans to build a marine mammal park where it said tourists would be able swim alongside dolphins and whales, and sample local cuisine – including whale and dolphin meat. The plans drew yet more international flak but Taiji’s mayor Kazutaka Sangen was undeterred. “We are not going to change our plans for the town based on the criticism of foreigners,” he said. If anything, Taiji’s growing infamy has widened the cultural gulf between the town and the rest of the world. Taiji, which has a population of about 3,000 people, has installed a 24-hour police box to deal with the steady stream of activists making their way to the cove. Locals bristle at the sight of Westerners. Conservationists say the fishermen have already killed over 170 dolphins and small whales this year and taken 24 captive since the start of the new year. A tweet from a team of activists overlooking the cove said the animals had spent a fourth night without food and would be slaughtered today by a party of about 40 to 60 fishermen. “I’ve been here for three years and this is absolutely the largest I’ve seen driven into the cove,” Melissa Sehgal, leader of the Sea Shepherd group, told Australian media. Ms Kennedy’s intervention has again produced a flurry of stories in the Japanese media. The state broadcaster NHK said the ambassador was known as an animal lover and her comments were likely to be taken in that light. “The debate is likely to continue,” it said. The message from Mr Sangen was more uncompromising. “The hunting of whales and dolphins has been carried out since long ago and is performed on scientific grounds,” he told Japanese reporters last night. The Earth’s Polar Regions, Antarctica and the area within the Arctic Circle, are the most inhospitable places on the planet for humans. Yet, scientists and researchers continue to explore and map these regions in order to get a better understanding of their importance. It is widely believed that the Polar Regions hold keys to unlocking other scientific mysteries and can reveal what the future holds for the Earth and all of its inhabitants. In order to better understand the Arctic and Antarctica, there is a constant need for better-quality maps to be produced. One of biggest steps taken towards supplying better maps of the Polar Regions has been recently completed by the Polar Geospatial Center (PGC). The center, located at the University of Minnesota, has released and made available a series of web-based applications using high-resolution images and maps showing the Arctic and Antarctica in unparalleled detail. These images are of an improved resolution and more up-to-date than earlier mapping projects of the Earth’s extremities. 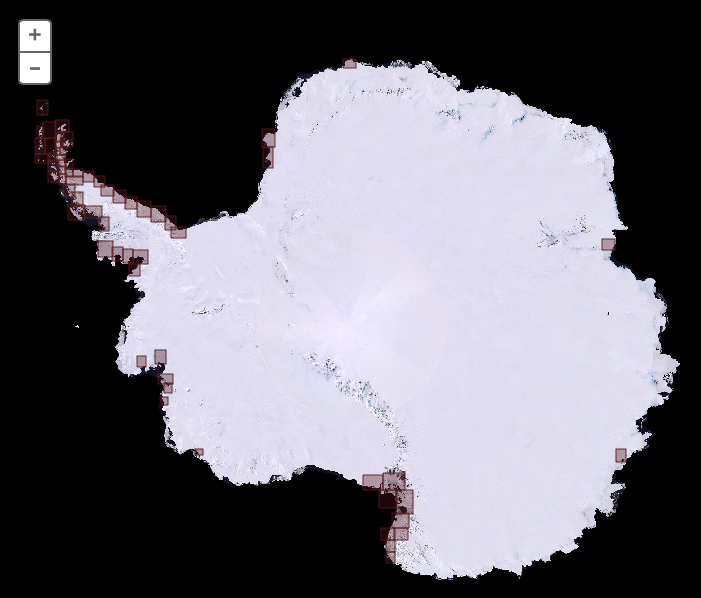 Previous mapping projects of Antarctica include LIMA, a mosaic of Antarctic images based on NASA’s Landsat satellite program. High-quality images of the continent were compiled into an all-encompassing satellite view and released in 2007 as The Landsat Image Mosaic of Antarctica (LIMA). LIMA was the result of collaborative efforts from the U.S. Geological Society, NASA, The British Antarctic Survey, and the National Science Foundation (NSF). What is distinctive about LIMA was the quality of its images. The project brandished images in 15-meter resolution, and it was the first true color, seamless map of Antarctica that was virtually cloudless. The LIMA mosaic is based on approximately 1,100 images taken from 1999 to 2001 from the Landsat-7. The project was developed as part of the International Polar Year back in 2007-2008 in order to educate people about Antarctica and demonstrate how scientists use GIS data to study the continent. One disadvantage, however, is that the LIMA mosaic does not cover the whole continent. A portion is left off of its satellite view from the South Pole at 90 degrees latitude to 82.5 degrees south latitude because of gaps in Landsat’s coverage. Nevertheless, the Polar Geospatial Center has taken polar mapping to the next level with their web-based applications. Using commercial imagery from the National Geospatial-Intelligence Agency, these maps of Antarctica offer a resolution 900 times better than that from LIMA and come within thirty kilometers of the geographic South Pole. According to the PGC’s director Paul Morin, their maps and applications can show every rock outcropping, every penguin colony, and every crevasse. Moreover, the Polar Geospatial Center has the ability to shoot images of Antarctica that are at a 50-centimeter resolution every forty-five days. In 2007, the Polar Geospatial Center was established in order to provide geospatial services to Antarctica. It mainly supported the U.S. Antarctic Program and was funded by the National Science Foundation. Since then, the PGC has expanded into doing its own fieldwork using geospatial data for the purpose of solving critical questions concerning the Polar Regions. The PGC also produces geospatial products for individual use. Their Imagery Viewers allow its users to create their own maps of locations in Greenland and Alaska as well as Antarctica. Web applications based on those types of high-resolution maps have incredible, almost limitless potential. The Polar Geospatial Center’s online maps can handle just about any request they get from scientists and researchers. The project was hardly simple, however. It took the PGC over eighteen months to complete, and one of the biggest challenges was fixing the orientation on an immense number of images. Instead of being shot at a vertical, these images were shot at an angle from commercial satellites owned by DigitalGlobe, Inc. and had to be corrected. To make these images of the Polar Regions more accessible to scientists and researchers, the Polar Geospatial Center has developed several web-based mapping applications, and they can be utilized in GIS software. The Imagery Viewers are three such mapping applications which cover much of Alaska, Greenland, and Antarctica. Some of the features of the maps include placename search, satellite imagery basemaps, and georeferenced maps. Unfortunately, the Imagery Viewers are only accessible to federal government employees and researchers with federal funding, not to the general public. However, the PGC offers other web based applications. One of them, called the Antarctic Air Photo Viewer, enables users to search, view, and download Antarctic aerial photography. These photos are offered in two different resolutions. Plus, users of PGC’s RapidIce Viewer can search for and download over 500,000 unique satellite images of pre-set places in Greenland and Antarctica. 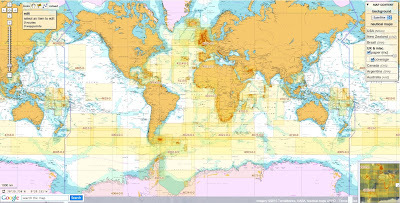 These web-based mapping applications can provide a large variety of uses. For example, Joe Levy, a scientist at the University of Texas at Austin used the images to study the melting of buried ice at a specific location in Antarctica. Overall, the hope is that improved maps of the Polar Regions will give scientists and researchers enhanced tools for solving the mysteries of the planet. Tools like LIMA and the web-based mapping applications from the Polar Geospatial Center proves that remote sensing technology can greatly increase our understanding of even the most forbidding and barren areas on the Earth. 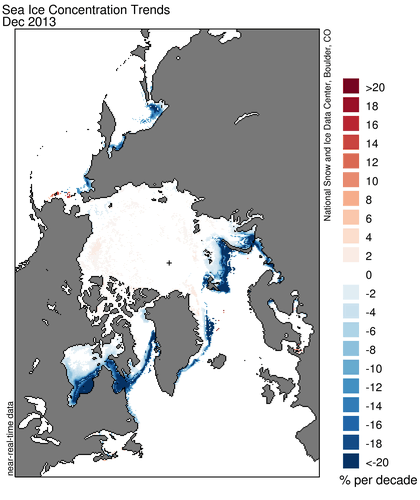 The monthly Sea Ice Index provides a quick look at Arctic-wide changes in sea ice. From the National Snow and Ice Center. 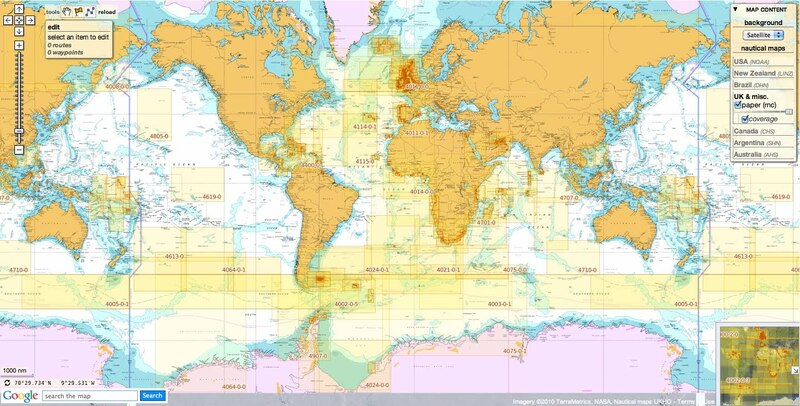 Almost everything we own and use, at some point, travels to us by container ship, through a vast network of ocean routes and ports that most of us know almost nothing about. Journalist Rose George tours us through the world of shipping, the underpinning of consumer civilization. 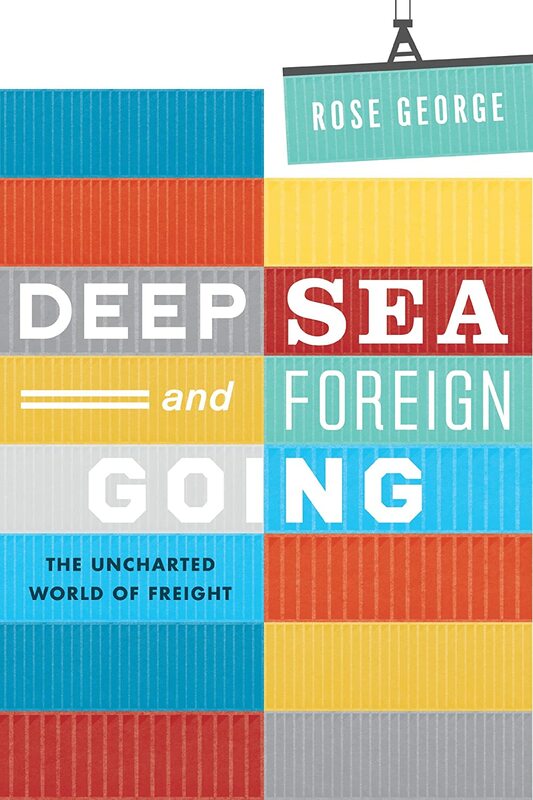 In this fascinating book, Rose George explores the hidden world of shipping. Once a major part of our national identity, the seafaring world is now obscure, badly regulated and yet, with more than 100,000 freighters on the seas carrying 90 percent of world trade, far more influential to our daily lives than at any time in history. George’s pursuit of the shadowy truths behind the industry that brings us almost everything we eat, wear and work with takes her across the globe, from Felixstowe to Singapore via the Bay of Biscay, Suez Canal, Gulf of Aden and the Malacca Straits. She follows the vast and circuitous routes travelled by mercantile and naval fleets, pirate gangs and illegal floating factories, meeting seafarers, dockworkers, tycoons, missionaries, stevedores, ship-spotters, beachcombers, environmentalists and even whales along the way. She reports on those who spend their working lives on ships, their experience at sea burdened by boredom and loneliness but tempered by the occasional survival story. She investigates the poor regulation endemic in the shipping industry which leaves crews with little protection and allows companies to deny their responsibilities. With stories of pirates, pollution, wreckage, rescue, whales and dolphins, mapping, navigation and invisibility, this is essential reading for anyone curious about the complex systems behind our convenient modern world. Don Walsh: "Going the Last Seven Miles"
Captain Don Walsh stops by the Googleplex to discuss: "Going the Last Seven Miles - a Personal Odyssey." Don Walsh and Jacques Piccard were the first people to go to the Marianas Trench over 50 years ago. Only James Cameron has been back since. Don jokes that he should have written a book called "The Right Stuff, Wrong Direction", alluding to how much public interest space has generated related to the deep ocean, our own innerspace. He advises the XPRIZE, is an Ocean Elder, and has captained a nuclear submarine. Next year he'll be on a National Geographic Lindblad expedition through the Northwest Passage.